Simeon Nasilowski was pursuing a PhD at the University of Adelaide when he became fascinated with game development. Today, his studio Two Lives Left launched its first game coded entirely on the iPad: Cargo-Bot. Riding the wave of interest in Apple’s iOS platform, Nasilowski and a couple of friends—John Millard and Dylan Sale—started working on games and projects as a hobby under the name Two Lives Left. The result of this was Codea, a platform for rapidly coding and prototyping games and visual apps using only the iPad. 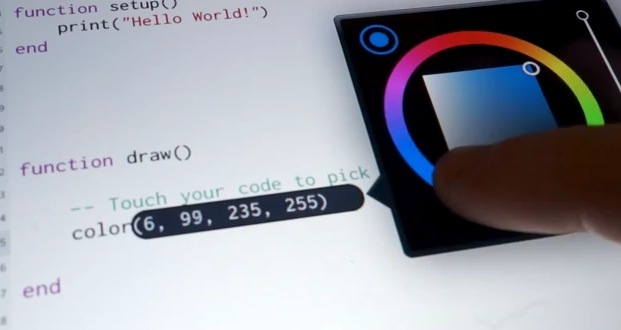 Flying in the face of the conventional wisdom—that the iPad is for consuming, not creating—Codea allows developers to use the Lua programming language and the iPad’s multitouch display to quickly build apps while viewing results immediately. Cargo-Bot was developed by Rui Viana and Two Lives Left over the course of 4 months, with Fred Bogg handling the music engine programming using the Codea API. The project originated in the Codea user forums, where Viana had premiered his game ‘Robot Arm’, coded using the tool. Nasilowski found the game intriguing, playing it for hours. He contacted Viana and the team began building Cargo-Bot. Viana did all of the programming on the iPad, initially using the iPad’s screen, then switching it up for an Apple Bluetooth keyboard. The visual design for the game was still done on a ‘regular computer’, but that won’t always be the case. An update to Codea is on the horizon that will allow importing of images via Dropbox and copy/paste, allowing for quick sketches on the computer or in another iOS app to be imported for prototyping in Codea. While designing complex custom graphics will likely continue to be the purview of a desktop or laptop for now, a future where apps are built from the ground up on iPads doesn’t look too far off now. Codea is interesting in that it manages to exist despite Apple’s restrictions that an app “cannot install or execute downloaded code,” as it would modify an executable on the iPad. Nasilowski says that the team was able to get around this with a very simple change: restricting users to sharing code via copy and paste, rather than a dedicated sharing feature. Because copy/paste requires user interaction and uses a standard iOS feature to input the code, it’s allowed. This makes it harder for users to share code back and forth, but Nasilowski says that it hopes to work with Apple to stay within its guidelines but find another, easier, way to share code back and forth with team members and the Codea community. What makes the whole thing even better is that Cargo-Bot is genuinely fun to play. A procedural puzzle-solver, it mimics the way that Codea is used to build apps one command at a time in a fairly obvious metaphorical way. I’m someone who uses the iPad for work more than most, writing long-form articles, managing much of my email and reading source material. I’ve also had some success using the iPad as a sketching and idea-formulating program, as has my Dad, a painter. Writing and drawing have often been focused on as some ways that the iPad can be used for creation of original content, but they’re not the only way and not even the most impressive. Frankly, I find the accomplishments of Cargo-Bot fascinating, because it’s way harder to code an app than it is to write a 15k-word article. Perhaps not in creative terms, but certainly in logistic ones. Code requires a lot of symbology and repetitive entry of complex strings. This is one of the reasons that Lua was chosen, it’s fairly symbol-light, as far as languages go. Even with the limitations of Codea so far, and the remaining need for a computer for some aspects of the art and visual design of the game, Cargo-Bot is an impressive accomplishment. We could very well look back on this as a watershed moment for content creation on the iPad and tablets at large.